Community assets across the Gulf Coast region are becoming increasingly vulnerable due to aging infrastructure, subsidence, and increased intensity of storms. Adaptation of our existing built environment is a necessary approach to increase resilience and ensure the livability of our communities in the future. At this workshop David Perkes shared his extensive experience in working to plan, design, and retrofit existing communities for greater resilience to coastal hazards. Mr. Perkes presented successful processes and strategies used to engage communities to retrofit existing buildings and infrastructure to accommodate storm surge and flooding. Innovative planning and design tools developed through applied research at the Gulf Coast Community Design Studio were highlighted through a hands-on exercise, in which attendees will have the opportunity to apply the learned techniques. Additional speakers, in the order of appearance, included Jennifer Gerbasi, Recovery Planner from Terrebonne Parish; Chris Pulaski, Senior Planner from Terrebonne Parish; and Chief of the Grand Caillou/Dulac Band of the Biloxi-Chitimacha-Choctaw Indians, Shirell Parfait-Dardar. 3. Case study examples of coastal communities that have successfully adapted progressive building and land use strategies to address risk while projecting economic growth. This page provides a summary and main takeaways derived from both the workshop and webinar. In Louisiana, increased vulnerability to natural hazards demands innovative planning and design solutions to adapt our existing communities to be more resilient. Great opportunities exist to strengthen our communities, although these measures can require significant upfront investment, stress fiscal constraints, inhibit short-term economic development, appear redundant, and generate conflict amongst stakeholders. To address the complex nature of these challenges, emerging planning, design, and construction techniques, such as water resource management, home elevations, and innovative zoning, are being used around the world and in Louisiana to allow communities to adapt and address vulnerability, while maintaining the essential functions and culture of the place. Today we are working not to seal communities off from risk but to better prepare them to bounce back faster, smarter and stronger after an event. But the application of “resilience” to planning can do much more than prepare our built environment for a difficult and unpredictable future; it can, in fact, catalyze positive change across many sectors and scales of a community. Changes that make communities more resilient to storms also benefit communities in terms of economic development and social stability. Through the Comprehensive Resiliency Pilot Program we have seen significant efforts to achieve resilience through innovative approaches to retrofitting communities. Workshop participants, as a group, developed a set of elements of a community resiliency center for day to day needs and post disaster needs. Day to day needs included: Recreation; Business Center; Classroom; Storage; Kitchen and Dining; Meeting; Laundry; Drainage and stormwater. Looking at the two lists, opportunities to overlap investment are clear. The exercise that followed built on the concepts of bridging and bonding social capital earlier presented by David, and the needs listed above and produced by the workshop participants. Workshop attendees were broken into three groups to examine three sites in Terrebonne Parish, and provide recommendations to retrofit each to be more resilient. The objective of the building design exercise is to produce a basic site diagram and building sketches of a proposed Community Resilience Facility that supports two program scenarios: the day-to-day community self-reliance program and the post-disaster program. The existing buildings are used in the exercise to give us a place to start but should not limit innovative ideas. The following questions are prompts to help the teams address the many considerations of retrofitting for greater resilience. 1. First, consider the building independent from its current use. What are the assets of the building’s location in the community, the building’s size, room layout, and the available property around the building? 2. Second, consider the hurricane wind and flood hazards for the site. What is the base-flood elevation compared to the site and building elevation? Are the building’s electrical, communication and mechanical systems at risk? 3. Third, consider the building’s material and construction method. Is the building strong enough? Is it feasible to renovate, add to and/or modify the building? 4. Now consider the building’s current use in relationship to the two program scenarios of the Community Resilience Facility. Does the current use work with the two program scenarios? If not what needs to change? 5. Finally, for each of the two program scenarios – the day-to-day community self-reliance program and the post-disaster program – do a site diagram and building sketches with notes of what activities are accommodated by their building as it is and showing what activities require changes and/or additions. The fire station in Montegut already serves as a place where first responders deploy during an emergency. This group examined ways to re-think cooperative relationships between the fire station and its neighbors, including a school, recreation fields, and a church. Assets of this site include: its location on a major road; and immediate access to a bridge that connects both sides of the bayou in Montegut. Also, the internal set-up of the site with a large amount of open space which connects civic buildings that have complementary strengths provides potential synergies. The group believes that with these improvements and cooperation, the Montegut fire station can build a strong community center that takes advantage of beneficial adjacencies. As the lone supermarket in Chauvin, the Piggly Wiggly is an important place for community interaction, as well as a business that provides access to food. The Piggly Wiggly site has several assets: it is easily accessible due to its location on a major road; it already stores major supplies; it is well known in the community; and it is a walkable location to the immediate neighborhood. The group that looked at this site hopes it can both allow for additional every-day benefit to the community, and provide post-disaster community benefits. 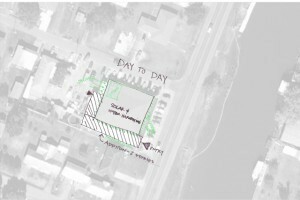 Some additional day-to-day benefits include: it provides a facility for building local skills; creates a destination for more than just grocery shopping – to instill the idea of it as a community center; and implement minimal interventions to the site and building to provide additional benefit to the property owner. 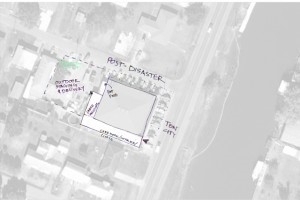 In a post-disaster scenario, the group hopes the site can provide a distribution center for critical supplies, and private meeting spaces for filing case work. The group proposed modest modifications to the existing building and site. A second story can be added to the section of the existing building with the flat roof and a separate entrance for access to the new community and storage space. In everyday use the second floor could provide space for community classes, computer literacy, and rentable meeting space, as well as space for storage of critical supplies for post-disaster situations. The entire building needs to be flood proofed. A new entrance to an existing commercial kitchen and restrooms will allow for shared facilities and avoid redundancy. In everyday use the upgraded kitchen allows for additional preparations of sellable products, as well as potential cooking classes for the community. In a post-disaster situation the kitchen could be used to prepare meals to distribute. Existing conditions of the site could also be used as an advantage in post-disaster scenarios. Existing parking spaces can be used to set up tents for walk-up information and supplies. Existing delivery space can be used for a drive-up/pick-up location for supplies. Also, Piggly Wiggly inventory could be sold and distributed with cost repaid to the store owner. These retrofit strategies would add significant value to the Piggly Wiggly as a center of strength and resilience to the community. The site, located on Shrimper’s Row, in Dulac, was granted to the Grand Caillou/Dulac Band of Biloxi-Chitimacha-Choctaw Indians through the Road Home Program. The group intends to build a community center on the property that will provide services to all citizens in the area for both every day and post-disaster situations. The group proposes specific programmatic elements for the building and site that would fulfill their needs. The building should have offices, public meeting spaces, classrooms, and places to store goods and supplies for use in disaster situations. On the site, space for Pow Wow and community gardens are important. The existing trees on the site should remain, and the group would like to save some cost by keeping an existing driveway on the site. The group discussed the basic layout and orientation of the building, preferring and L-shaped building to maintain light quality and air flow under the building with southern exposure for a community garden. An option of having g parking integrated into the pattern of existing trees that are to remain was explored, as well. To be inviting to all in the community, the group decided that a welcome center or sign, and public space or gardens should be located at the front of the site. The group believes that the community resilience center can provide vital day-to-day and post-disaster services to an underserved population.